Prem Watsa’s holding company, Fairfax Financial Holdings Limited, recently published its 2018 Annual Letter, in which briefly discussed some of its 13F positions. You can track a copy of the letter – here. Fairfax Financial Holdings Limited shared its views on Kennedy-Wilson Holdings, Inc. (NYSE:KW) as well, explaining that it always had a good relationship with, currently owning 9.2% of the company. We have had an excellent relationship with Kennedy Wilson, its CEO Bill McMorrow and Bill’s partners, Mary Ricks and Matt Windisch, since we met them in 2010. We own 9.2% of the company. In 2018,Kennedy Wilson sold three of our joint venture properties in Dublin for a gain of $74 million, an average annual return of 21% on our original investment, and returned $107 million of the proceeds to Fairfax. Since inception in 2010, we have invested $855 million with Kennedy Wilson, received cash proceeds of $858 million and still have real estate worth about $351 million. Our average annual realized return since inception was 21%. We continue to acquire properties through Bill, Mary and Matt with the purchase of one office building on 26 acres in Denver,Colorado for $85 million with a cash on cash yield of 6.7%; three office buildings outside Portland, Oregon for$29 million with a cash on cash yield of 6.2%; and nine office buildings on 67 acres outside Los Angeles, California for $163 million with a cash on cash yield of 7.5%. These Class A office buildings are anchored by investment grade tenants in strong and growing markets and were available at quite significant discounts to replacement cost. Kennedy-Wilson is a Beverly Hills, California-based real estate investment company, with a market cap of $3.06 billion. Year-to-date, its stock is up by 16.54%, and on March 29th, it had a closing price of $21.28. It is trading at a price-to-earnings ratio of 20.57. At Q4’s end, a total of 13 of the hedge funds tracked by Insider Monkey were bullish on this stock, a change of 8% from the previous quarter. 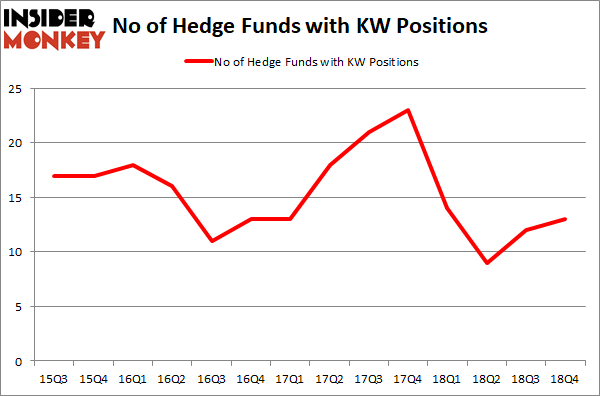 The graph below displays the number of hedge funds with bullish position in KW over the last 14 quarters. So, let’s check out which hedge funds were among the top holders of the stock and which hedge funds were making big moves. Among these funds, Fairfax Financial Holdings actually held the most valuable stake in Kennedy-Wilson Holdings Inc (NYSE:KW), which was worth $242.1 million at the end of the third quarter. On the second spot was Elkhorn Partners which amassed $80.2 million worth of shares. 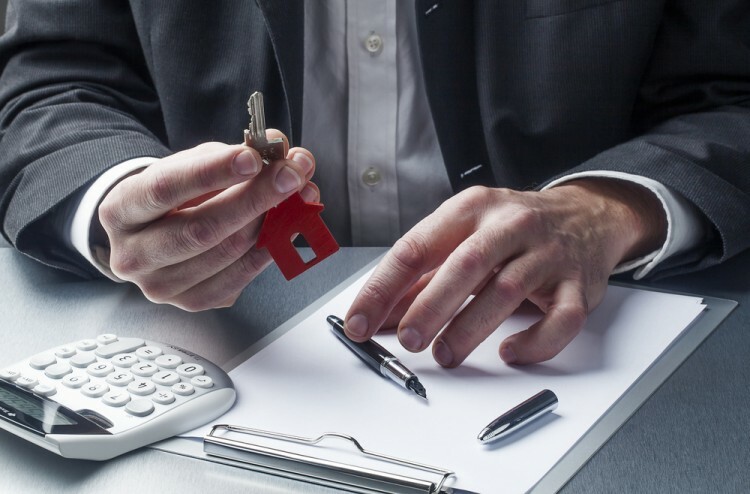 Moreover, Royce & Associates, ACK Asset Management, and Sprott Asset Management were also bullish on Kennedy-Wilson Holdings Inc (NYSE:KW), allocating a large percentage of their portfolios to this stock. In its last financial report for the fourth quarter of 2018, Kennedy-Wilson disclosed GAAP Net Income of $30.7 million, or $0.21 per diluted share, compared to GAAP Net Income of $99.2 million, or $0.69 per diluted share in the same quarter of 2017.